When you think of the Camargue, you picture Wild White Horses running free, imperious black bulls thundering through the marsh and Pink Flamingos flying in V-formation. By popular demand, we’ve combined the three so you get the best of all Camargue wildlife. 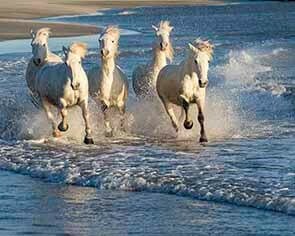 Photographing the Wild White Horses is a dream come true for most people. It’s an exceptional experience with or without the camera to see this world-renowned and noble breed splashing through the shallow waters of the marshland with the Gardians (Camargue Cowboys) on horseback. The famous Black Bulls are also a big part of life in the Camargue and we offer a unique opportunity of capturing the bulls thundering through the marshy shallow water with their horns held high. Our extraordinary Flamingos & birdlife photography is run by our talented specialist BBC Wildlife birdlife photographer. The Camargue is surrounded by the largest cultivated reed-bed in Western Europe, offering an unbelievably wide range of habitats, each with its characteristic flora and fauna and migrating birds. A top pick for Wildlife and Equine photography. We will gather for a welcome drink and briefing meeting early evening. Informal group dinner at local bistro (optional). In the morning, we head to the beach for the first shoot with a single white Stallion. We photograph him dashing and diving in and around the sea and surf, as well as rearing on the top of the sand dunes, making for a wide range of dramatic action shots. In the afternoon, we capture the Camargue Black bulls thundering through the marshy shallow water with horns held high, herded by the Gardians on horseback – a unique photographic experience. We leave before dawn to spend the day at the Parc Ornithologique, which is a natural Camargue wetlands area. Our specialist BBC Wildlife photographer, Thierry, is regular here and is expert on where to be and at what time to get the birds at their very best. Thierry is the only person authorised to access the park before sunrise and before it opens to the public so you can capture wonderful, exclusive images as the birds fly in to begin their day. You can capture a wide variety of shots – Camargue birds on their own and up close, Flamingos congregating in pairs or in a group and you can even create a landscape image with the birds in the water together at dawn. You can also take some stunning sunset shots as the birds take flight in V-formation at the end of the day. 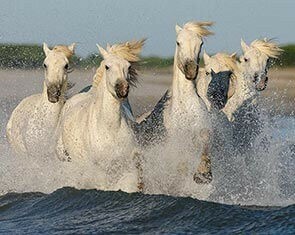 At dawn we photograph the Wild White horses running through the marsh. We shoot several drives with the horses running across and towards your field of view. We will also take shots of the ‘Gardians’ (Camargue Cowboys) dressed in their traditional Camargue shirts & hats, trident in hand, surrounded by the herd as well as some close-up portraits of the ‘weathered’ ranchers. Late afternoon we have another session with the horses running together through the shallow waters of the marsh. After the action, we then take portraits of the horses on their own or in small groups, silhouetted against the sunset. At dawn, we photograph the sparring stallions – this is a unique opportunity to see the White horses entwined at full height, in feisty temperament with their manes flying. Free time for lunch before departures to the airport.